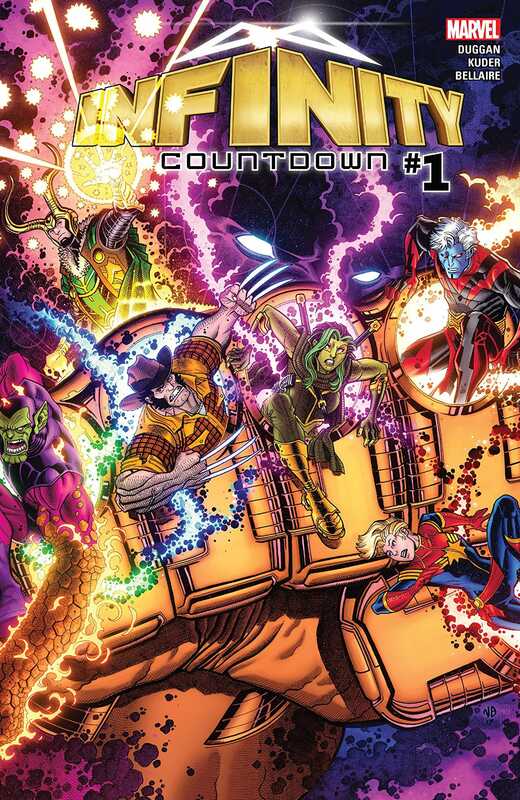 Infinity Countdown #1 Review – AiPT! Do Duggan and Kuder deliver on impossibly high expectations? All the hints, dodges, and near run-ins across the Marvel Universe have been leading to this: Infinity Countdown and the return of one of Marvel’s most beloved characters: Groot. Did I swerve you? So did Gerry Duggan. Like all of the Infinity series, this event centers around the fabled Infinity Stones, now in new hands and new forms, but still with everyone in the galaxy hunting them down. Along with Commander Eve Bakian and members of the Nova Corps, Drax the Destroyer is watching over the newly gigantic Power Stone. An attack from Talonar and his Fraternity of Raptors disrupts Drax’s attempts at meditation. Meanwhile, the rest of the Guardians of the Galaxy, along with Ant-Man and Nova, are busy taking on an Elder of the Universe: The Gardener, Ord Zyonz, and his pack of rabid Anti-Groots. I know they’re not called that, but why not? To be completely honest, at the point where the Anti-Groots (I’m going to keep calling them that no matter what Gerry Duggan says) and the crazy-eyed Gardener showed up, I was about to check out of the series early. I like artist Aaron Kuder’s style, but nothing in the first few sections of the comic stood out to me as “event-level” art. Drax looks extraordinarily simplified and Rocket just looks goofy. His style works very well for tiny Groot, however, and the Anti-Groots are sufficiently tree-like. The Gardener, however ridiculous the name, caught my attention. Insane, buggy eye? Check. Wild hair and beard? Check. Ant-Man catching a glimpse of him going commando? Check. I’m back in. There are several very funny moments in the comic that I keep going back to in my head. The first is Talonar realizing that Bakian is pregnant and asking her to leave the battlefield in what must seem to him like a magnanimous gesture. Drax trying to fly using Falcon Frat-Boy wings is also a moment that made me laugh out loud. The fight scenes really ramped up as the book progressed, allowing Kuder to really stretch out beyond individual characters and show his real skill at the broader battle scenes. The arrival of the Chitauri and the Anti-Groots showcase his attention to detail that I think was missing in the opening scenes. Two MAJOR events happen in the end of this book, the first being something that made me actually gasp. For an industry that tries so hard to throw “never before” around, this one is going to make waves, especially if there is any bleed-over into the MCU. The second is at the end of the book, post-Gardener and Chitauri invasion (they just keep invading), involving Black Widow hiding out in Madripoor. Just when you thought we’d finally get the big return to the land of the living, Marvel drops another Infinity Stone into the hands of the world’s deadliest assassin. Seems that we will all have to wait for the public return of The Wolverine until next time. With all the hype leading to the return of both the Infinity Stones and Logan, everyone has high expectations for this series. If Duggan and Kuder keep up the good work, I think most people will be pleased.